Towards the end of the summer, I moved. That move lowered my commute from 7.5 miles to about 2.5 miles. As a result, I thought I would consider biking (rather than driving). [Note: I know that 7.5 miles is actually still a short enough distance to commute by bike, but because of the bends/curves/hills, I wouldn’t have felt safe commuting by bike.] There is no shortage of hills on my commute by bike (as it is), but because I’m on hardly used roads, I feel much safer. I’ve been commuting by bike for 5 weeks now and I rather enjoy it! I’ve only driven in a couple of instances (last-minute!) and taken the bus a couple of times, too. For the most part, I’m riding to and from. 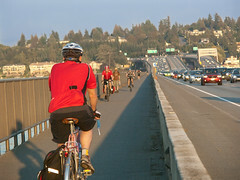 One of the best parts about commuting by bike — it forces you to exercise. There are some days when you “don’t feel like going to the gym,” (even though you had planned on it), but with a bicycle being your main method of commuting, you’re forced to exercise. There’s also the whole environmental aspect (pollution of the car, etc.). In my experience commuting by bike, I can see some of the downsides: weather (it’s why I’ve taken the bus a couple of times), helmet hair, storage (I carry it on my back! ), and maybe worst of all — wardrobe. While I’ve seen pictures of people who do, I don’t know how comfortable I would be cycling in a three-piece suit. And depending on the weather, there can be a bit more perspiration. But there are a number of pros, too: fresh air, no traffic, exercise, and saving on gas! If you’re thinking about changing the way you commute, I hope you consider cycling.